The great team at Fender has just announced a whole batch of new guitars at this year’s NAMM convention in Anaheim, California. Fender frequently uses this time of year to reveal new body finishes and modifications to popular lines of guitars. And we, like everyone else, of course, are incredibly excited to get our hands on them. Firstly we begin with a selection of guitars from the Fender Rarities collection. Combining exotic tonewoods with high-class pickups and unique features, this collection is full of exciting specifications. So, if you think you know Fender, then this collection really pushes the boundaries of expectation. Although we shouldn’t be surprised. After all, this is the same company that changed the sound of popular music. Pickups: Pure Vintage ’65 Gray-Bottom Single-Coil Strat. Body: Roasted Alder with Quilt Maple Top. Bridge: 6-Saddle Pure Vintage Synchronized Tremolo. Secondly, we have a couple of Jimmy Page Signature Telecasters. His original guitar, featured on the song Good Times Bad Times, came in the form of a simple White Blonde lacquered finish. But, in a moment of inspiration, presumably after one of his legendary big nights out, Page began giving it the mother of all makeovers. In the first place, Jimmy created the ‘mirror guitar’. And then, it was followed by a famous design, hand painted by the great man himself. So, in homage to Jimmy’s famous riffs, tone and artistry, Fender has given the world a pair of new Jimmy Page Signature Telecasters. 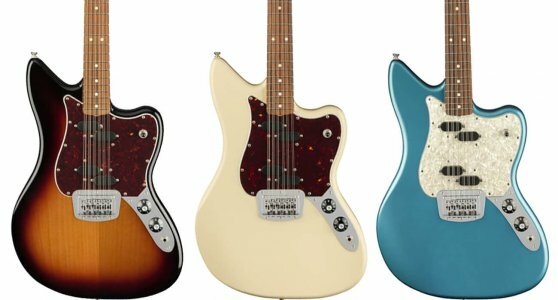 If you’re the kind of person who takes pleasure in hybrid creations, such as mythical beasts or a portmanteau, then this range of Fender guitars will really get you rubbing your hands until they burn. The series splice together the DNA of popular guitars, resulting in the creation of new and unique instruments that further highlight Fender’s innovation. However, on this occasion, we’re focusing on this marvellous looking 12 string. It comes on a Jazzmaster body shape and in three new finishes. Furthermore, it features, features dual split-coil pickups. Both the Stratocaster and Telecaster are regarded, by some, as the most loved and iconic guitars in history. When they dropped, way back in the 1950s, they changed the course of rock ‘n’ roll. And, as a consequence, the way players approached the guitar in general, too. Therefore, with those two guitars, Fender cemented itself as an irreplaceable cog in the ongoing machine of popular music. So, Fender has popped the hood of these ever-popular instruments and given them a few upgrades. It is, in other words, evolution, not revolution. Finally, we move onto the Elite Series. Mixing modern sound with a deluge of innovative features, this guitar certainly pushes the envelope. Its design will please modern players, especially those who demand tonal variety and a supple playing feel. Overall, it’s a top-draw performer that delivers the goods each time it’s plugged in. So, that concludes our NAMM 2019 Fender roundup. If you’ve seen something you like then get in touch with the sales team at Rich Tone. Or, better still, pop down to our store in Sheffield and try out a few of these excellent guitars.